Bathrooms are often the smallest room in our homes, but we all have to spend plenty of time in there! If you are planning a bathroom reno, you have a variety of options to maximize this small space. First, decide how you want to allocate your space. Analyze your bathing habits. Do you really need a large tub, or would you prefer a more luxurious shower? Do you have kids who need a bath, or is this room for adults? Would a compact sink basin be too small? Think about the colour of your fixtures, too. Darker colours can make the room seem even smaller. Perhaps you could add splashes of colour with your soft furnishings. Once you’ve decided what fittings you want, you should research space saving bathroom fixtures. 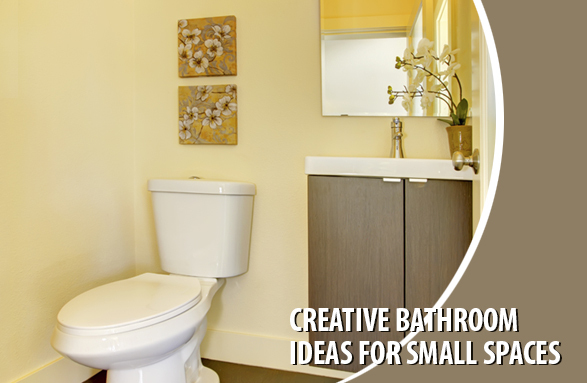 Short projection toilets and sinks are a great option for tiny bathrooms. Make sure that your faucets are also short projection, as traditional sized faucets can overwhelm smaller basins. If you do want a tub and a shower, install the shower over the tub. Some tubs have curved ends to give you more space. Consider installing glass shower walls, instead of shower curtains, for additional light in your bathroom. If your bathroom is very tiny you could make it into a wet room, with the entire floor tiled as the drain. Depending on the size of the room, you could have folding glass shower doors. If you decide on this solution, make sure you install non-slip mats. Your décor can add an illusion of space to your smallest room. Light, bright colours are the best for small bathrooms, particularly if you have no window in your bathroom. Add decorative interest with a splashback of coloured tiles behind your sink. Mirrors also effectively add the illusion of space. If you keep the fixtures and walls plain and bright, you can add accent colours with your soft furnishings. A bright shower curtain whose colours are picked up in the towels could provide all the colour you need – with the advantage of being easy to update! Declutter your bathroom. Keep everything but your toothbrushes, skin and hair products in the bathroom cabinet, or even in another room. Keep the floors uncluttered. Consider wall-hung sinks and toilets, which add to the illusion of space. Plus, they make cleaning much easier!